"...it is my argument that more than at any time since Australian Federation, we need as a nation to develop a new democratic consensus for the future. The 21st century holds not only great opportunities, but also significant challenges and contradictions." "Prosperity but economic insecurity; fairness versus market liberalisation; globalisation coupled with external threat. How can we reconcile these contradictions to ensure future prosperity, social justice, and security? For too long these challenges have been used to generate division, envy and fear. The consensus that we once shared is gone, and we must forge another. The core of this new democratic consensus must involve an honest appraisal of the economic, social and political challenges at present and in the future." We thank The Bob Hawke Prime Ministerial Centre for publication of this lecture; this page is an adapted copy the page found at the University of South Australia's Hawke Centre website. The speech can also be found at the ACTU website and at other places. 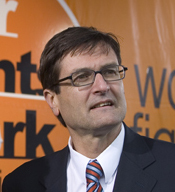 Greg Combet became Secretary of the Australian Council of Trade Unions (ACTU) in February 2000 and is a Director of Australian Super and Members Equity Bank. Born in 1958, Greg has tertiary qualifications in engineering, economics and labour relations and the law. He worked as a miner and in minerals exploration before being employed by the NSW Tenants' Union as a project officer and then by the Lidcombe Workers' Health Centre. Greg started work with the Waterside Workers' Federation in 1987, one of the unions that merged to form the Maritime Union of Australia. He became a Senior Industrial Officer at the ACTU in 1993 and was elected ACTU Assistant Secretary in 1996. During this time, Greg worked with unions representing employees in a wide variety of industries, and has overseen the ACTU's Living Wage Case for low paid workers since 1997. Greg became Secretary of the ACTU in February 2000, following the resignation of Bill Kelty. Greg has coordinated numerous union campaigns, including the high profile 1998 waterfront dispute and the effort to rescue the jobs and entitlements of Ansett workers. In 2004 he led the campaign and negotiations with James Hardie to secure funding for compensation for asbestos victims. In 2006 Greg became a member of the Order of Australia Honours in recognition of his work in industrial relations and on behalf of asbestos victims. 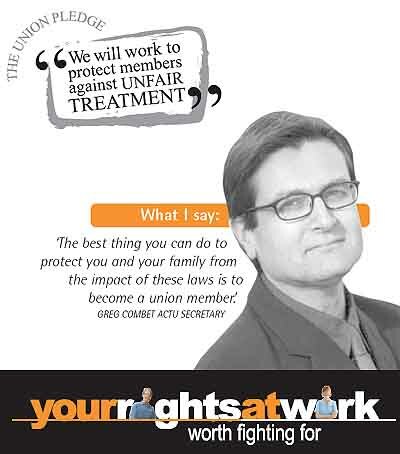 Greg is currently leading the "Your Rights at Work" Campaign against the recent industrial relations legislation changes. Although Australians have divided over many issues in the last century, our nationhood has broadly been underpinned by a shared aspiration for economic prosperity, security from external threat, and the attainment of a fair and just society. This shared commitment to prosperity, security and fairness has survived the challenges of booms, busts and war. These values have been fundamental to Australians since what Paul Kelly called the "Australian settlement" at the time of Federation, over 100 years ago. For much of the last century these values laid the basis for a common understanding of the role of government, and enabled broad agreement on many important national and international policies by governments of different political character. That is not the case today. Our enduring historic consensus has been overwhelmed by policies that must invite our deepest attention and questioning. Are we truly convinced that economic prosperity can only be achieved at the expense of social fairness and equality, that democratic rights must be traded for security and that ballooning fiscal surpluses have the principal purpose of providing short-term political advantage? A new consensus for the 21st century is called for, one which draws upon the strength of our historically shared values and which reignites hope for a better future. Long-term economic and political challenges must be addressed to assure future prosperity, the revitalisation of our democracy and a renewed emphasis on social fairness and inclusion. To achieve this consensus a debate is needed about fundamental questions: What are our long-term economic challenges? What can governments do to address them? What workplace rights should underpin future economic prosperity? Is enough being done to plan for future environmental and social challenges? Is our approach to security on the right path? Is our system of government and democracy able to meet the demands of the 21st century? The quality of debate in Australia about these and other important issues is lamentable. The labour movement in partnership with other organisations and citizens with shared values can do much to lift the standard and build a consensus for the future. Only by building a new consensus can Australia confidently set forth once more to achieve prosperity, security and social justice. While the views presented by speakers within the Hawke Centre public program are their own and are not necessarily those of either the University of South Australia or The Hawke Centre, they are presented in the interest of open debate and discussion in the community and reflect our themes of: strengthening our democracy - valuing our cultural diversity - and building our future. It is a privilege to be giving this lecture in honour of Bob Hawke. The ACTU held its 2006 Congress a month ago, 50 years since Bob attended his first Congress and came to the attention of the union movement. Bob has been an inspiration to me - as a unionist, a scholar, an advocate, a politician and as leader of his country. His contribution to the labour movement is unlikely to be exceeded. The question I am addressing tonight is one which will always be associated with Bob Hawke. How can we, as Australians, create a democratic consensus around the issues which are important to our present and to our future? Although Australians differ amongst themselves over many issues, our national identity and beliefs have been broadly underpinned by a shared aspiration for economic prosperity, the attainment of a fair society, and security from external threat. Our nationhood was founded in a policy consensus around these three pillars. But at this early point in the 21st century there is no consensus. Rather, there is division, and deliberate deceit and distraction from the real issues. Political opportunism, divisiveness and disregard for civil rights and democratic principle is evident at unprecedented levels. The long-term economic, environmental, social justice and security issues are not being effectively addressed by the current Federal Government. We need a new Australian consensus for the 21st century - a new framework for engaging with the future - a consensus which unites rather than divides us. The times demand a national debate about some fundamental questions: What are our economic challenges? What can Government do to address them? What workplace rights should underpin future economic prosperity? Is our system of government able to meet the coming social and environmental challenges? What can be done to improve the quality of our democracy and public policy making? The labour movement - the trade unions and the Labor Party - has a vital role to play in developing a democratic consensus in the community in answer to these questions. It is the labour movement which has historically upheld the basic values of prosperity, fairness and security for all, and which has produced many of Australia's biggest and most progressive ideas. It is the labour movement which has an abiding commitment to the improvement of Australian democracy. I believe that the labour movement should work to make the next Federal election a referendum on the real issues facing the country. These issues include those which I will address tonight - industrial relations, economic growth and productivity, education, climate change, and political reform. I believe that the labour movement should continue to develop a narrative about Australia and the issues we must confront as a nation. We should aim to develop a democratic consensus about the issues and the policy solutions. If this is achieved I am confident that Labor will win government. The starting point in this task is the articulation of our values, and particularly our democratic values. Democratic values go much further than the right to vote, important as that is. Democracies are distinguished from totalitarian regimes by their commitment to values of tolerance, economic and social justice and accountability of government. There are countries which, on the surface, have relatively free voting systems, but which are characterised by corruption, lack of civil rights, unaccountable security forces and lack of concern for fair treatment for all its citizens. Wherever governments put human rights and social justice behind other priorities you will see a weakening of democratic values. This is happening in Australia. We have a government which has consolidated its power through division, dishonesty and opportunism. It is prepared to unleash every evil spectre, including racism, xenophobia and contempt for those unable to fend for themselves for political gain. It is shameless in the face of exposure of its dishonesty and incompetence about Iraq, refugees throwing their children overboard, and the AWB. Don't forget that this government took the country to war over weapons of mass distraction that did not exist, at a time when a corporation closely linked to the National Party and the Government was bribing Saddam Hussein. This is a Government which is prepared to indefinitely imprison men, women and children on desolate islands for the crime of seeking a better life - a Government which has squandered the proceeds of an historic economic boom while failing to invest in long term prosperity - a Government which has handed massive tax cuts to people who don't need them while cutting off meagre benefits from those who most need help. Australia stands alone amongst developed nations in supporting employers who refuse to negotiate with unions even when this is what their employees want. The Tampa or children overboard did it for some people, the missing weapons of mass destruction for others. For many workers I represent, the fact that Australians building a railway in Western Australia can be dragged into secret proceedings on pain of imprisonment, and then individually sued, because they stopped work to support a colleague - a union delegate - drives home that something sinister is happening in this country. Democratic countries do not hold secret interrogations of ordinary workers under threat of gaol because they went on strike. You've only got to say it to see immediately that something is wrong with our democracy. Real democracies encourage the highest standards of behaviour in all aspects of public and private life. Good governments inspire their citizens to be optimistic about the future and generous towards all human beings, irrespective of race, religion or economic status. The assertion of the labour movement's values, our commitment to tolerance, our aspiration for social and economic justice, our respect for civil and democratic rights, these are the foundation stones of our alternative agenda. They stand in sharp contrast to the values demonstrated by the Howard Government. Democratic values translate into practical rights. Collective worker organisation through freely operating trade unions is a central element of democracy, and yet unions are under threat in this country. The right to organize and freely associate in a union belongs with the right to vote, to assemble peacefully, to speak openly and to be tried in public by one's peers. Free trade unions, not controlled by governments or employers, are important guarantors of democratic rights. The right to bargain collectively has been fought for and died for - remember the Tolpuddle martyrs, the Harlan County miners in depression-era America, and the Solidarity ship builders in 1980s Poland, to pick just a few of countless examples. In our own country, the fight of the shearers and other workers in the 1890s was formative to our own democratic history. The industrial turmoil of the time directly contributed to the formation by the trade unions of the Australian Labor Party, to the support of the labour movement for Federation, and the establishment of a constitutional means for preventing and settling industrial disputes. The economic and social upheavals of the 1890s also dismayed the more liberal-minded drafters of our Constitution and led directly to what the writer Paul Kelly has called the Australian Settlement. The elements of the Settlement - tariff protection, conciliation and arbitration of industrial disputes, the White Australia policy, imperial benevolence, and state paternalism - were designed at that time to ensure security for all sectors of society, including farmers, manufacturers and workers. In the United States, the horror of the Great Depression led directly to Franklin D Roosevelt's New Deal, including job creation through public works, the first laws setting minimum wages and maximum hours underpinned by organising, representation and bargaining rights for trade unions. The introduction of strong labour laws moderating the abuse of power by business enabled the US Government to enlist workers and their unions in the fight against the devastating effect of the Depression and, later, in the titanic struggle against fascism. It is sometimes overlooked that inflexible state control of unions was a feature both of European fascism and Stalinist communism. Free trade unions with strong collective bargaining rights were established by the United States in occupied Germany and Japan, and encouraged throughout post-war Western Europe. This philosophy was reflected in the International Labour Organisation, which in 1948 and 1949 adopted conventions confirming the right of workers to freely associate in unions and to bargain collectively. I have emphasised this history to encourage you to appreciate the significance to our democracy of the right of workers to join together in and be represented by a union. It is basic to consideration of the Howard Government's industrial relations laws, which is the first policy issue I would like to address. As I have pointed out, industrial relations was a plank of the democratic consensus at Federation. Obviously it is pivotal to the ACTU and the focus of my work and thinking, but its importance stems from the centrality of work to the lives of most Australians and their families. The Howard Government's attack on workers' rights is an attack on democratic values which goes well beyond industrial relations. It is part of a concerted move away from the consensus which has characterised much of Australia's history and which was pivotal to Bob Hawke's approach to government. Although the Hawke Government was instrumental in opening the economy and therefore diminishing the historic reliance on tariff protection, it did so in the context of a continuing commitment to fairness and a decent safety net. Initiatives like Medicare, Family Benefits, additional payments to low paid workers under awards, and universal superannuation were all directed towards combining economic competitiveness with fairness - an approach ultimately abandoned by the Howard Government. John Howard's industrial relations laws demonstrate the belief that economic prosperity and fairness are mutually exclusive - that we can only compete internationally by attacking workers rights and the safety net. This proposition is nonsense. Prosperity and fairness are not mutually exclusive. The national interest does not require that some should prosper at the expense of others. Contains extraordinary coercive powers, including abolition of the right to silence and protection against self-incrimination where there are suspected breaches of the industrial laws. These measures diminish the quality of Australian democracy and directly contravene internationally respected human rights. Last month's ACTU Congress endorsed an industrial relations policy based on democratic values, centred on the idea that when a majority of workers in a workplace democratically decide to exercise the right to bargain collectively their employer should be obliged to engage in bargaining. For the 21st century we need a flexible industrial relations system - a system based on collective bargaining underpinned by a decent safety net - based on democratic decision making in the workplace rather than paternalistic institutions. A workable and fair collective bargaining law requires that parties be obliged to negotiate in good faith about all the issues which they consider relevant to their relationship. Fairness also means that where employers refuse to negotiate for an agreement against the wishes of a majority of workers the Industrial Relations Commission must be able to make specific and enforceable orders for good faith bargaining to occur. Fair bargaining rights include the ability for workers and their unions to take industrial action as a means of balancing the economic power of the parties. Australia currently has the most restrictive and punitive laws on industrial action in the developed world. There will always be some disputes which cannot be resolved through negotiation and mediation. The ACTU supports arbitration of issues in dispute by the Industrial Relations Commission, as a last resort, where bargaining has failed or where a party refuses to negotiate in good faith. National economic wellbeing and fairness in the workplace are not mutually inconsistent. In fact, I assert the contrary proposition - that the achievement of economic prosperity demands that workers rights be respected. Experience demonstrates, particularly in the Australian context, that co-operative workplaces deliver productivity, and it is productivity which should be at the centre of our economic attention. Because the fact is that the Government's IR laws do not address the real economic issues faced by Australia. The most important economic challenge is to boost productivity. Australia's productivity growth has crashed in recent years. Coupled with the easing of commodity prices, the end of Australia's sustained productivity growth means that we face uncertain economic times ahead. During the second half of the 1990s, productivity growth averaged about 3% per annum. It is now 1.3%. This means that there are now significant constraints on GDP growth and improved living standards. There is also a risk of higher inflation and interest rates. Labour cost-cutting under the new IR laws will not address this problem. The solution can only be found in improved productivity. This is where the Howard Government has not only been asleep at the wheel, it has been lazy and irresponsible. The Howard government has had the benefit of an improvement in the terms of trade of more than 40% since coming to office a decade ago. With Australia's export prices surging from the resources boom, and the prices we pay for imports declining as a result of technological change and global competition, Australia has experienced a windfall gain in the form of billions of additional dollars of Government revenue. But the opportunity to lay down the fundamentals for our economic future has been squandered. Since 2004 the Howard Government has committed $100 billion to initiatives best described as attempts to purchase short-term political favour. And yet we face acute skill shortages, underinvestment in social and economic infrastructure and clear evidence of failure to meet future needs in health and education. Unless we can address these longer-term issues we will face even more serious constraints on future growth and competitiveness, at tremendous cost to Australian living standards. Adequate investment and leadership in infrastructure and innovation is one of the keys to productivity improvement, which will ensure that all our citizens will have access to decent living standards. "will do as much to drive innovation, the economy, and job creation in the 21st century as did access to the telephone, interstate highways and air travel to the 20th century." And yet Australia ranks 17th out of 30 advanced countries in broadband take up. The Government's priority in communications is the privatization of Telstra at any price - a rolled gold example of economic vandalism. Looking at other infrastructure sectors, demarcation disputes between different tiers of government have clouded the issues. I do not support Peter Costello's proposal for a Commonwealth grab for power. Rather, the country needs determined leadership to achieve an unprecedented level of cooperative Federalism. Much of the infrastructure investment and reform which is required is within state jurisdictions, and yet a national approach is needed. Just consider some of the priorities - water, electricity and energy, transport, facilities to deliver education and skills training - all are state responsibilities. A National Infrastructure Council with the task of identifying priorities, rationalising regulation and establishing clear responsibility for each sector with one tier of government, whether state or Commonwealth, could help to strip some of the political posturing from the process. Kim Beazley has spoken about how this could work, and I strongly support him. The union movement is heavily involved in superannuation, and I can tell you that as investors there is great interest in infrastructure projects, including in the energy, transport, telecommunications and water sectors where this can be shown to produce reasonable and stable returns to fund members. We would support the creation of a market for nation building infrastructure bonds, allowing workers retirement savings to be invested in the future of the country. A further great economic task is to encourage innovation, particularly in manufacturing. It is a matter of grave concern that our current account deficit has smashed through 7% of GDP in the middle of a resource boom and when the terms of trade have been favourable. Competitive pressures are threatening to demolish our manufacturing industries, which have recorded zero growth over the last three years including three quarters of negative growth. Elaborately transformed manufacture exports have collapsed, the import share of domestic demand has almost doubled in 15 years and production continues to move offshore. While the traditional infrastructure about which I have already spoken is critical, we cannot compete internationally unless we are prepared to make strategic investments in research and development - in innovation. This means long-term programs of government incentives to encourage firms to move up the value chain - enhancing their capabilities in design, product development and export market expansion. The debate is no longer about protection versus free trade. Australian manufacturing industry is heavily internationally exposed now and will be even more so by 2010. But this should not mean that governments give up on manufacturing. It means that governments must do all that they can to promote competitiveness. The State and Territory Labor Governments have accepted this challenge. In partnership with business and unions all of these governments recently produced a strategic plan to boost Australian manufacturing. The Howard Government was encouraged to participate, but did not do so. The strategic plan sets out practical priorities to encourage investment, to facilitate an export focus, to stimulate research and development, and for skills and training. It does so while recognising the realities of the global trading environment. It is a further example of the way in which key economic priorities can be addressed by developing a democratic consensus. I hope that Federal Labor not only embraces the manufacturing plan, but campaigns and wins support for it in the lead up to the Federal election - making Australian jobs a key election issue. Education and skills will also be pivotal issues around which to develop a democratic consensus. We currently face manifest problems in these areas. A recent Monash University study confirmed that there has almost been no increase in the numbers of school leavers entering university since 1996, and that an effective cap on the number of funded places is the main reason. Recent recognition of our acute skills shortage highlights the importance of education and training as an economic issue, but rather than address the problem it has created the government has responded with yet another multimillion dollar advertising campaign to quell political concern. The US spends twice the proportion of its GDP on higher education than does Australia. Could it be that this explains, better than differences between our industrial relations laws, the superiority of US productivity and competitiveness? Australians know education is at the root of our success as a nation. Overwhelming public support could easily be built for a massive increase in additional university places for science and engineering students and a scholarship program to support it. Our governments should have a plan for thousands of extra places in TAFE, including for school leavers. A program could be funded to give firms with advanced equipment an incentive to lease access to TAFE colleges so we develop world-class training standards. But education is about much more than the needs of our economy for skilled workers, important as this is. Universal education is a central component of any democracy. In Australia we need to confront some substantial educational issues. In particular, the lack of support for quality public education for all our children pushes the goal of greater social cohesion and the improvement of our democracy further and further away. The flight from public schools in many of our urban and rural areas is a national disgrace. The issue is not whether parents should have a choice between private and public schools. The issue is whether governments should provide decent education for all children, irrespective of whether their families are able or willing to contribute financially. Our democracy is failing if all of us do not support a concerted effort to improve public education. Public schools offering improved educational opportunity to every child would be the best way to address social inequality and division. A study (by the Australian National University and La Trobe University) of 26,000 students starting Year 9 in 1995 and 1998 confirms that children of high ability from disadvantaged backgrounds are badly under-represented at university, and are not converting their ability into successful university entry scores. For students of comparable ability, two out of three from a privileged background go to university, while only one out of five from disadvantaged backgrounds did so. Those from disadvantaged backgrounds who do make it to university outperform students from more privileged backgrounds. Of course there are public schools which currently perform to a high level, particularly where they are properly resourced. There are other public schools which need support to improve outcomes and rebuild community confidence. The evidence shows that this is particularly the case in localities where there are high concentrations of low income and disadvantaged families. This needs money, resolve, national leadership and cooperation between governments. School buildings need to be upgraded, educational resources need to be boosted, and teachers need to be better trained, supported and rewarded. Industry superannuation funds associated with the ACTU have taken a small and somewhat controversial step towards the improvement of public education infrastructure by investing in public schools in New South Wales through public-private partnerships. The motivation has not simply been commercial, it has also reflected the aspiration to contribute to better schools. The investment was controversial because of our historic belief in the need for public, not private, investment in public school facilities. But as a nation we must all be driven by the need to improve the quality of education outcomes, and not be blinkered by ideology. I'm sorry to have to say it, but when you consider the priorities of the Howard Government in education and skills development, ideology seems to dominate. Rather than tackle the issues I have averted to, its priorities include the promotion of individual contracts for TAFE teachers and university staff (where government funding is denied if individual contracts are not offered), and the prosecution of culture wars over the teaching of history. Education and training is another key area where the labour movement has the opportunity, and more importantly the underlying values, to win a democratic consensus about the importance of investment for the future. Climate change is an important challenge which also falls into this category. If we don't meet the challenge of climate change we will be sentencing ourselves not only to the widely discussed environmental impacts, but also to growing social division and international instability. The recent survey by the Lowy Institute received considerable publicity for its finding that only 14% of Australians thought that the threat of terrorism has been reduced by the war in Iraq. I would have thought this was pretty obvious. Far more interesting was that global warming was seen as a critical threat by 68% of respondents, narrowly beaten by international terrorism and nuclear threat, but well ahead of Islamic fundamentalism, bird flu and large numbers of refugees arriving in this country. Further, improving the global environment was seen by 87% of respondents as a very important foreign policy goal, compared with 74% for combating international terrorism and 65% for promoting economic growth. Climate change is real, and it matters. Australia is perhaps more vulnerable than any other developed country to dwindling water supplies and associated drought, to more frequent bushfires, and declining land area for pasture. Climate change is a scientific and technological issue, not just a moral one. However, if predictions by the like of Tim Flannery or Lowy Institute researchers are correct, climate change could be the greatest attack on our values that we have ever experienced. Rising seas together with more catastrophic weather events, including droughts and floods, threaten domestic and international security on an unprecedented scale as governments lose legitimacy and people fight for living space and access to resources. There is no easy and obvious solution, however there are things which can and should be done. The call by the Business Roundtable on Climate Change (which included the CEOs of companies like Origin, Westpac, IAG and Visy) for a national market-based carbon trading mechanism has been heard only by State governments and Federal Labor. A recently released discussion paper proposes a scheme whereby companies, such as electricity generators, would be allocated permits for a fixed level of carbon emissions. The companies then have the choice of reducing their emissions or buying additional permits from companies which have already reduced emissions. Permit trading creates a market which prices emissions and encourages thereby reductions in carbon production. Australia also needs to do more about renewable energy, in particular by encouraging growth in solar and wind energy by increasing the Mandatory Renewable Energy Target. While costly and technologically uncertain, carbon sequestration (burying the gases underground) or developing "clean" coal needs more commitment from industry and government. Given our substantial reliance on the coal industry and resulting high per capita greenhouse emission levels, this is an obvious area where Australian scientists could and should be given the opportunity to take the lead internationally, with economic and environmental benefits. A small but significant step to support renewable energy has been taken by industry superannuation funds associated with the ACTU through the acquisition of Pacific Hydro. The principal revenues of the company are derived from hydroelectric and wind energy. We are hopeful that this initiative will deliver solid returns on workers retirement savings, as well as contribute to an expansion in renewable energy capacity. The Federal Government's response to climate change has been inadequate. Rather than establish a representative body to genuinely engage the community, investigate the impact of climate change in Australia, and put forward a range of responses, the Howard Government appears to have decided that nuclear energy is the answer. Compare this approach to the detailed and considered work commissioned by the Blair Government in the UK contained in the recently released Stern report. This report aims to build an understanding of the issues, to analyze the economic impact, and posit responses for the consideration not only of the British government but the wider international community. In contrast, John Howard's approach is divisive, and intentionally so. Rather than educating and informing, generating discussion, and building consensus on this critical issue, he commissions a report dealing only with nuclear energy confident in the knowledge that the recommendations will suit his political objective. And the objective is to try and 'wedge' Labor on the nuclear issue, to polarise opinion not unite it. The community deserves better from its government. I have always been and remain against Australia contributing to the nuclear fuel cycle because of the contribution which could be made to weapons proliferation, because of the dangers associated with nuclear energy, and because of the problem of waste disposal. What Australia really needs is a mature and open debate of all of the issues involved in climate change. But this debate should not be confined to nuclear energy, it must extend to consideration of all other potential energy sources as well as the means by which current carbon emissions can be significantly reduced. I have addressed a number of issues relating to economic prosperity and social fairness, and would like now to touch on the third pillar around which a new democratic consensus should be developed, that of our external security. Since September 11, 2001 and the subsequent Bali bombing Australians have focussed more on external threat than at any time since World War 2. Five years on from September 11 it appears to me that a substantial reappraisal of our position is required. Iraq, rather than the terrorist threat, has dominated politics and diverted massive resources from the main game. As a result of the premeditated decision by the US to invade Iraq we are divided over Iraq, rather than united against terrorism. No matter how repugnant the regime of Saddam Hussein, there can be little doubt that the invasion of Iraq has been disastrous. It has escalated the terrorist threat. Arrogance, false and concocted intelligence, opportunism, corruption, naivety and the paving stones of good intentions have all contributed. In hindsight it has been a series of major blunders - the most serious foreign policy error committed by an Australian government since the Vietnam War. Increasingly this is being recognised, even by those in the US and UK who initially supported the invasion on moral or strategic grounds. The fact is that Saddam Hussein did not have weapons of mass destruction. The fact is that several years after the invasion Iraq still hovers between sectarian civil war and unstable democracy. The fact is that at least on one estimate, hundreds of thousands of people have lost their lives. The fact is that Iraq should never have been conflated with the war in Afghanistan. As journalist Geoffrey Barker observed earlier this year, the tragedy is that Iraq commands the bulk of US and British resources while Afghanistan remains vulnerable and while regional terrorist threats press against us. In addition to these issues, one has to question the value to Australia or to Iraq of our very limited involvement. While we are not the Pacific's police force, our special role and responsibility is in our region. The Australian community deserves to be engaged in an honest reappraisal of these issues and the mistakes which have been made. This is not to suggest a questioning of the US alliance - rather we can attend to a strengthening of the relationship by getting ahead of the debate which will inevitably occupy US politics in the lead up to the 2008 presidential election. As we have seen recently, the politics of Iraq have already changed sharply in the US. I have no doubt that troop withdrawal from Iraq on a sustainable geopolitical basis will be a key focus of that election. Even the creation of politically autonomous regions appears to be part of current US thinking. In Australia a reappraisal is demanded so that a democratic consensus about our external security can be forged. Kim Beazley deserves credit for the leadership he has shown on this issue. Contrary to conventional wisdom there are reasons to believe that security may be a strength for Labor and a weakness for the Coalition at the next election. Finally, I do not think it feasible to consider the long-term challenges for the country without recognising the fact that our national system of governance promotes systemic short-term political decision-making. I believe that constitutional change is necessary in the national interest. The constitutional requirement for national elections every three years restricts our potential for policy making to only a short period in each electoral cycle. In these times of constant media excitement three year terms means the pre-election period starts before the completion of the second year, making even medium term planning difficult. A modest contribution to improving this problem would be to introduce four year terms, with an election able to be called only after three years. I acknowledge that constitutional change is difficult to achieve, and has proved to be almost impossible without the kind of political consensus which generally eludes us. But this problem needs to be tackled, and all political parties have a responsibility to act in the national interest on this issue. Four year terms with some flexibility is an improvement on the current situation, is rational, and I believe would be supported by most Australians following a sensible debate. Longer electoral cycles will help governments willing to tackle the biggest issues affecting our society. This is not the only governance issue. The establishment of an Australian republic with our own head of state is another obvious one. The debate about the republic needs to be rescued from constitutional complexity and cheap shots at the Royal Family. It needs to be linked to the debate about values - about the kind of country we want to be in the 21st century - and I am perhaps naïve enough to think that in the foreseeable future we will take this important step, having developed a democratic consensus in support. And the reality is, I think, that a democratic consensus demands a democratic election of an Australian head of state. In conclusion, it is my argument that more than at any time since Australian Federation, we need as a nation to develop a new democratic consensus for the future. The 21st century holds not only great opportunities, but also significant challenges and contradictions. Prosperity but economic insecurity; fairness versus market liberalisation; globalisation coupled with external threat. How can we reconcile these contradictions to ensure future prosperity, social justice, and security? For too long these challenges have been used to generate division, envy and fear. The consensus that we once shared is gone, and we must forge another. The core of this new democratic consensus must involve an honest appraisal of the economic, social and political challenges at present and in the future. This is the task which can and must be undertaken by the labour movement. Our commitment to prosperity, social justice and security demands it. We want decent rights for working people. We want to boost wealth and living standards. We want to overcome inequality and poverty. We want a better deal for working families. We want to build education, health care and retirement savings. We want to build the nation, and be open to the world. No one in the labour movement should lack motivation, because there's a lot to be done. And it's not just our staying-power that keeps us going during very difficult times. It's our values and our collective commitment to a better future.